Skype Alternatives noted that users could communicate between each other using ooVoo by manners of instant messaging, voice and video chat; all of them are all very useful. Even those these functions are all available with Skype, Skype Alternatives saw that ooVoo has better picture and video quality available as compared to Skype and has excellent sound quality for it’s free version. This is why it was so good that I chose to switched from Skype to ooVoo in the future for calls with my peers overseas. In ooVoo, you can call landlines or mobile phones like how a usual telephone device would perform. Just dial the number and viola, you would be in touch with your close ones without much hassle. Skype Alternative noticed that ooVoo offers Worldwide Phone Service meaning you can call to phones from the other side of the Earth, great for companies which are aggressively pursuing globalization. In ooVoo, you can even add your phone participants to your video calls; great for executives who are still on the road to participate and chime in the current meeting. 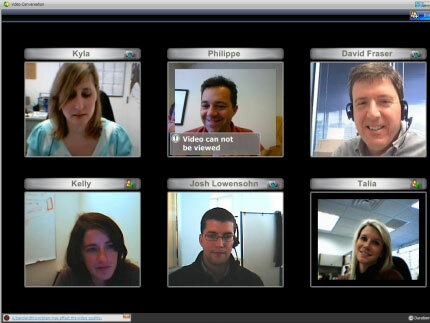 By using ooVoo, you can have up to six way video calls. This would mean you could have an interactive experience akin to what you are used to when meeting up. This is also very useful for communicating with friends or partners overseas; whenever you have urgent news or have something interesting to share to the whole clique, you can now. What is more is that this function is provided by ooVoo.. completely FREE! You would not have to pay a single cent for 6 way video calls and is perfect for young adults who just want to have a blast with friends. Skype Alternatives know that these functions are available for all OSes that ooVoo provides, meaning even if you have an iPad and are dying to chat with your friends all on Desktop, you certainly can now! Another fantastic function of ooVoo is the ability to leave video messages. Skype Alternatives tested this function in ooVoo and it worked; our friend Raj certainly received our message to start a video conference! This function is visibly missing in Skype where you would need to download third party software such as Pamela which would be perhaps be a hassle. A video is provided below would help you in your endeavours to leave video messages. ooVoo also have Desktop Sharing as seen by Skype Alternatives where an user can share his or her desktop to his or her friends whenever they want to. This would help users who have problems on their computers for other users to help. Whether it is an adware, malware, bug, Desktop Sharing would allow other users to view their problems. It would also allow people who wants to share certain things on their computer to other users making ooVoo a must have amongst Skype Alternatives.